This walk: 2012-6-27. War Horse walk, Gutter Tor, vermin trap, abandoned apple crusher, unfinished cross, trig. point, Ditsworthy Warren House, tinners' gert,kennels, speedwell, dung fungi. Link to Google Satellite view of the area - this view shows Ditsworthy Warren House where much of the domestic farm scenes were filmed. An earlier walk to this area - 3 Feb. 2010. Sheep's Tor, SX 566 682, elevation 369 metres (1210 feet). in the mist, with a certain tree that can be seen in some film scenes. There was some military activity going on here today, recruits being put through their paces somewhere. This stone is where Albert's friend sat as Albert started training the horse, Joey. to come to his (American Indian) owl call. Another photograph showing "the tree" with Sharpitor and Leather Tor (at extreme right) in the background. Really securely secured! One combination lock can open the gate. The locks are used individually by the Land-owner (Lopes-Maristow), the Commoners, Emergency Services (incl. Search & Rescue), MOD and DNPA. Removing one lock enables the others to slide along and release the bolt that secures the gate. Gutter Tor (also known as Gotterknap Tor, Gotetorre & Cut Tor) - 1st rock pile. Gutter Tor / Ringmoor Down triangulation pillar, at 350 metres elevation (1148 feet). Ah! All day breakfast, elevenses, luncheon, afternoon tea and evening dinner. The light vertical stripes are raindrops! Looking down, in the mist, at Ditsworthy Warren House (its position marked by the pointer). Foreground, sidewalls converging onto a granite vermin trap, where stoats/weasels were caught to protect the rabbits being bred in the warren's pillow mounds to feed the local tinners. Closer view looking down on the roof of the trap, at SX 57881 66754: vermin would have entered from left or right, stepped onto a platform that released two vertical slates and thus closed the trap. The recently found, unfinished Gutter Tor Cross (SX 57886 66775), seen earlier on 21 Jan. 2010. An abondoned, damaged(?) apple crusher, a few feet from the cross, towards the track..
A view of the apple crusher (centre foreground) and the cross. The vermin trap, apple crusher (hidden from view) and the cross (marked by the pointer). Zomed view, all done by pick and shovel. The track (bridle path) approaching the farm from the west, that Albert and Joey came down, coming home from WW1, in the final scenes of the film. A view of the farm at Ditsworthy Warren. The ruins of the peat store (peat was burned for heat and cooking). The house looks a lot different in the film when it was given a false roof with imitation thatch. A view to the Big Shed, used as a paunching house - for gutting and skinning the rabbits produced by the warren. Reputed ferret kennel - perhaps the animals were put in via the hole at top left and then this was blocked with a stone. One of three dog kennels in Kennel Field, each facing a different direction so that the dogs could find shelter no matter which direction the wind came from. This one is in the east corner, facing west. Kennel in the north wall, facing south. Kennel in the west wall, facing east. This corner of the Kennel Field was the vegetable garden in the film. Another view to the kennel in the east corner. This area was done up with an artificial barn, where several scenes were filmed in the film. The field that became the turnip field in the film, where Joey learned to pull the plough that could split rocks! Dad's plough never did that, that's for sure! I remember being the runner with buckets of water for the shire horse that he used for ploughing. I remember also I could carry two buckets on the handlebars of my bike - and not a lot was spilled. Looking to the house from the field. The trees where Albert called Joey from. Unidentified fly on a jacket sleeve - it didn't wait for another photo, though. The nearest identification I can manage is Thyme-leaved Speedwell (Veronica serpyllifolia) but the flower spike is more pronounced in this specimen than in my books: M. Skytte-Christiansen (1965) The Pocket Encyclopaedia of Wild Flowers, Blandford Press, London; Francis Rose (1981, 2006) The Wild Flower Key, Frederick Warne, Penguin Group; W. Keble Martin (1965, 1976) The Concise British Flora in Colour, Ebury Press. The leaves are paired and opposite, small and ovoid compared to most other speedwells. Dung roundheads (Stropharia semiglobulata), more rounded than the more delicate, domed tops of dung bonnets, Bolbitius vitellinus. A photographic clich�, Gutter Tor, framed by fir trees. Unidentified toadstool or was it a bracket fungus? View of the undersurface of the fungus, a porous surface. 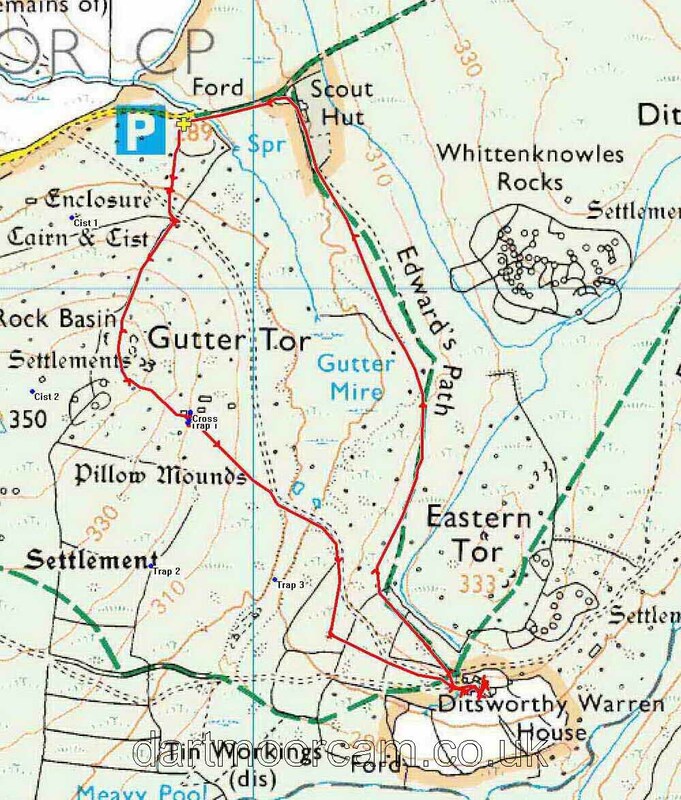 This walk was reached via the A386 Plymouth-Yelverton road, through Clearbrook, Brisworthy, Ringmoor Cottage to the Scout Hut car park, marked by the P symbol and the yellow cross on the map.